George Graham Reviews Carbon Leaf's "Love, Loss, Hope, Repeat"
Given the current state of the commercial music industry, the concept of thoughtful, intelligent rock might seem like something of an oxymoron. But as this program tries to do every day, if one looks beyond what is found on the media conglomerates, one can find a great deal of worthwhile music that might even sound vaguely mainstream. This week we have an excellent example -- a band who bring the literate lyrics of a singer-songwriter with a tasteful combination of rock and acoustic instrumentation. It's the latest recording by the Richmond, Virginia-based band Carbon Leaf, called Love, Loss, Hope, Repeat, and it's their seventh release. 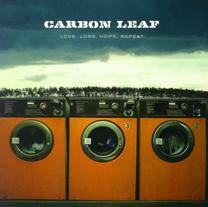 Carbon Leaf began when singer and songwriter Barry Privett and guitarist Terry Clark were both students at Randolph-Macon College. Guitarist Carter Grevatt and drummer Scott Milstead started jamming with Clark, and Privett joined as a vocalist in 1992. The band broke up for a while after the members graduated from college and landed non-musical jobs. But they re-formed in the mid 1990s, with the members sharing a house in Richmond. They started attracting attention and releasing independent CDs, which further enhanced their reputation, with their winning a national talent competition. In 2004, the band with Jordan Medas on bass, released Indian Summer, after being signed to the venerable Vanguard label. They toured extensively, opening for the Dave Matthews Band, John Mayer and others. Indian Summer was, for most people who had not gotten to hear the band's independent recordings, a very impressive debut of a band that combines elements of roots rock with even hints of art rock held together with intelligent lyrics and classy vocals. Now, two years later, they are out with Love, Loss, Hope, Repeat, and the group seems to have narrowed their sound a bit, but the material remains first rate, with perhaps even better lyrics this time around. Barry Privett again writes all the words, while the rest of the band composes the music. For the project, they brought in producer Peter Collins, who has worked with artists ranging from Bon Jovi to the Indigo Girls. Previtt, who writes all the lyrics, says that the songs came together rather quickly, mainly in the studio, with producer Collins doing some editing of the ideas. The album's title comes from one of its songs, and Previtt said that it reflects the melancholy tone of much of the CD. There are the expected contingent of love songs, but also a couple of traveling songs as well as an examination of the images of war. For our sonic grade, we'll give the CD about an A-minus. There is fairly good clarity, and their combination of acoustic and electric instruments are captured well. The dynamic range, the way the recording handles loud and soft moments, is a somewhat better than the contemporary average for a rock band. For over a decade, Carbon Leaf has been making worthwhile, intelligent, classy rock , and gradually gaining wider recognition. Love, Loss, Hope, Repeat, their eighth album, is probably their best yet, and should hopefully attract even more fans to this deserving band.